Huge Savings Item! Save 14% on the Hallmark Keepsake 2017 THE WIZARD OF OZ A Few Bad Apples Sound Christmas Ornament by Hallmark at Two Clock. MPN: 3495QXI3025. Hurry! Limited time offer. Offer valid only while supplies last. Relive a classic scene from THE WIZARD OF OZ when DOROTHY and SCARECROW innocently try to pick apples from the talking trees on their way to OZ. View More In Ornaments - Page 10. Relive a classic scene from THE WIZARD OF OZ when DOROTHY and SCARECROW innocently try to pick apples from the talking trees on their way to OZ. Press a button on this Christmas ornament to hear dialogue from the orchard. Battery-operated sound feature includes 2 replaceable LR44 batteries. Festive and collectible, Hallmark Keepsake Ornaments come ready to give in a seasonal holiday gift box. The box can also be used for ornament storage. Press button to hear memorable moments from the classic scene in the apple orchard. This Hallmark Keepsake Ornament measures 3.7 x 4.4 x 3 inches and comes in a 4 x 5 x 3.4 gift box. Magic Sound ornament is made of plastic and features sound (batteries included). Each piece includes one 2017 THE WIZARD OF OZ A Few Bad Apples Sound Christmas Ornament in a gift-ready box. From preserving precious memories to commemorating special milestones, there's a Keepsake Ornament for everyone on your list. Hallmark has been your family-owned creator of greeting cards, gifts, gift wrap and more for over 100 years. We take deep pride in helping individuals connect in just the right way. This Hallmark original Keepsake Ornament features unparalleled artistry and exceptional detail. The ornament is lead-free and made for years of celebrations. 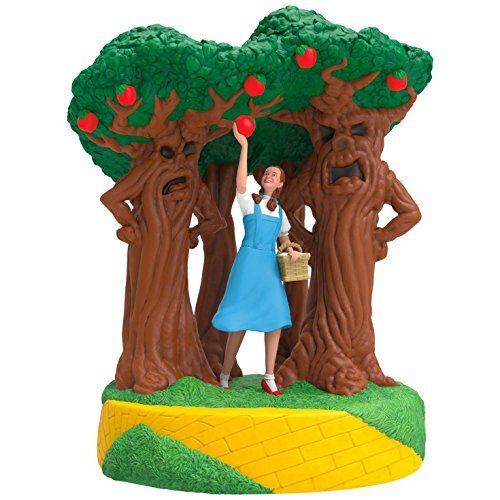 This Christmas tree ornament depicts the classic scene as DOROTHY picks fruit from the trees in the apple orchard. Press button to hear their conversation. Two replaceable LR44 alkaline batteries included. Press button to hear memorable moments from the classic scene in the apple orchard. This Hallmark Keepsake Ornament measures 3.7 x 4.4 x 3 inches and comes in a 4 x 5 x 3.4 gift box. Magic Sound ornament is made of plastic and features sound (batteries included). Each piece includes one 2017 THE WIZARD OF OZ A Few Bad Apples Sound Christmas Ornament in a gift-ready box. If you have any questions about this product by Hallmark, contact us by completing and submitting the form below. If you are looking for a specif part number, please include it with your message.